Hope the storks have been working out, because a 250-to-300-pound bundle of joy is headed for the Houston Zoo! 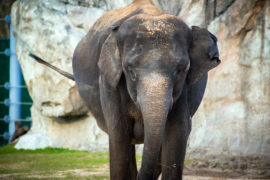 Shanti is pregnant and after a two-year gestation, the 26-year-old Asian elephant will give birth this summer. Shanti is one of the Houston Zoo’s eight Asian elephants, and mother to youngest calf, Duncan (3) and Baylor (7). Zoo officials are optimistic that this pregnancy is advancing normally and on schedule. 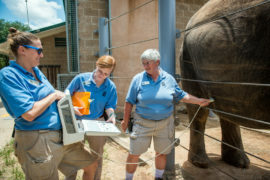 Shanti has received nearly two years of pre-natal care by the zoo’s elephant team and four veterinarians with regular ultrasounds and blood work. The zoo team will continue to monitor Shanti as she progresses into the labor process, indicated by a hormonal change in her daily blood analysis. Shanti will give birth in the McNair Asian Elephant Habitat cow barn under the supervision of her keepers and veterinary staff. After delivery, she and the calf will undergo post-natal exams and spend several days bonding behind the scenes. The elephant team looks forward to watching the pair share several key moments that will prepare them for their public debut. Nursing, communicating with mom, and hitting weight goals are important milestones for a growing baby elephant. This is an exhilarating summer for the elephant team. 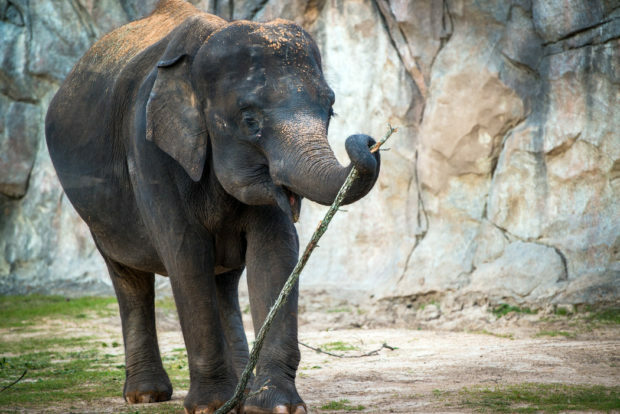 In May, the zoo opened an expanded elephant habitat which doubled the entire elephant complex and immerses guests into the lives and culture of Asian elephants. The new bull barn and expanded yard gives more room for this growing herd. Just by visiting the Houston Zoo, guests help save baby elephants and their families in the wild. A portion of each zoo admission and membership goes straight to protecting an estimated 200-250 wild e lephants in Asia. Since the Houston Zoo started its work in Borneo in 2007, there has been a doubling of the elephant population on the island. The Houston Zoo also provides funds for elephant conservationist, Nurzhafarina “Farina” Othman and her team in Asia, to put tracking collars on wild elephants. This group uses collars to follow wild elephants, conducting valuable research that aids in protecting the elephants as they travel through the forests. Farina also spends time working with farmers that grow and produce palm oil, offering her guidance in responsible cultivation practices that are wildlife-friendly. Palm oil is an ingredient in many foods and cosmetics, typically grown in areas that were previously home to animals like wild elephants. Converting pristine forests into oil palm plantations has caused extensive deforestation across Southeast Asia. Luckily, a growing number of producers are working to protect these areas and the animals that live there. The Houston Zoo encourages people to protect elephants in the wild by supporting companies that use responsibly sourced palm oil, increasing demand for palm oil that is grown and produced without destroying the forested homes of elephants.